Grate the potato and carrot into a clean tea-towel and squeeze out any water. In a large bowl add the grated potato and carrot and mix in the curry powder, spring onions, egg yolk and coriander, mix well. Divide the rosti mixture in 4 and then shape into rosti shapes (flat circular shape approx. 15cm in diameter). Heat the sunflower oil in a large frying pan and cook the rosti’s until golden and crisp before turning cooking on the other side. While the rosti is cooking place a pan of water on the stove about 3” deep and bring to a simmer and add a tablespoon of white wine vinegar. Pop your grill onto high. Place the haddock onto a tray, dot with 10g of the butter and cook for about 6-7 minutes. Crack the eggs into the simmering water and poach for 3-4 minutes. Lastly melt the remaining 10g of butter in a saucepan and cook the spinach until wilted. 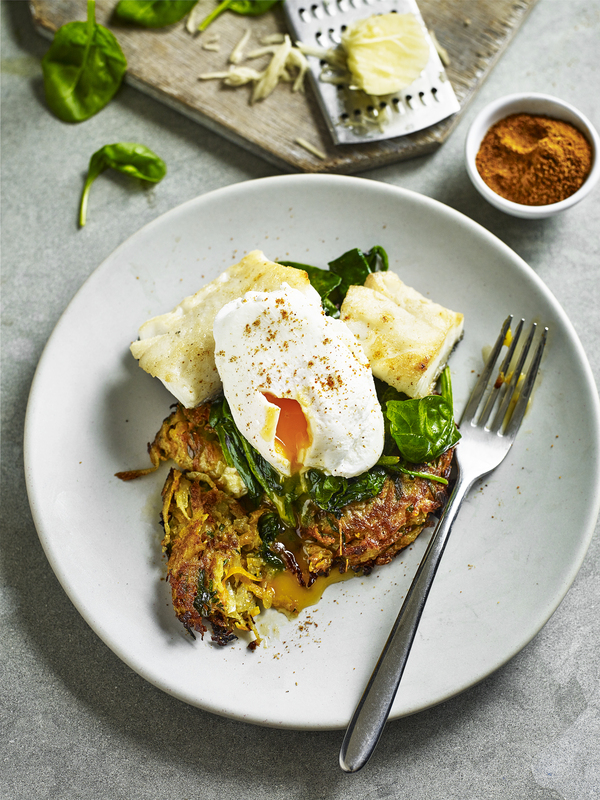 To plate up, place the rosti on your plates, top with the spinach, then the haddock and finally the poached egg. I like to sprinkle a little curry powder before serving.